There’s two stories to this page. The first, is this: imagine that religion is a tool, like any other tool. The same way animals use very simple tools, like sticks or rocks, they have very simple religion. But humans, with our dazzling creativity, make far more complicated tools, and religion is no exception. What if the religions we came up with to keep bronze age sheep herders in line are simply the wrong tool for the job of modern living? I would say, they are. Religion is about forming a intangible place where you go with your friends. Religion tells you who you are supposed to love and who you are supposed to hate. It’s a chalk circle and the people on the inside are your family and everyone on the the outside is the the Other. But modern life blows apart the simple clean line of the Us and the Other. So how to do know who is in our tribe, in our clan, of US and not the hated Other? Materialism. We don’t take our identities from the rocks and stars anymore. We don’t take them from our parents because life is going so fast, our parents lived on different world then we do. We take our identities from the things we buy and know others by what they buy. If such a world, our aesthetic is our tribe, and the aesthetic we can afford, our class, in the Clan that tribe belongs too. As such, the aesthetic we maintain is the soul, postindustrial. I am Goth because to be so is to believe that existence is brief in comparison to the eternity of death. Like my spear chucking ancestors before me, I need to believe that this life is sacred. I am Steampunk because if we are what we do, then the tools we used to do it are all that remains when we die. Memories fade, lovers move on, but the tools we use live on. Steampunk (not unlike the SCA I also love) is form of religion archeology, where we understand ourselves by re-imagining the way of those who came before. 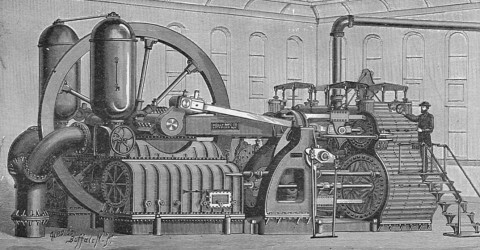 Steam powered industry took the agrarian fantasy of the late medieval ages and ground it dust under the castiron wheels of progress. In steampunk and goth, we celebrate Neo-Victorianism as the last days of the pre-industrial heart beating in modern humanity.